This year, as we give thanks for the many blessings the Almighty has bestowed upon us, I thought it might be useful to have a little back-pocket history ready in case there is a lull in the table conversation at Grandma’s. 1. America wasn’t the Pilgrims’ first choice. What was their first choice? When the Pilgrims left England looking for religious freedom, they went first to Holland. Why? It was closer, for one. And second, Holland was and remains a very tolerant society. Those of you who have spent time there know what I mean. Nobody was going to mind a bunch of taciturn pilgrims seeking asylum for their religion. They’d be background noise to some of the other craziness going on. The Pilgrims stayed in Holland for over a decade before they decided to look for a new home. Life in Holland wasn’t what the Pilgrims expected. Turns out that the problem with really liberal societies is that, well, they’re really liberal. It’s a difficult place to raise kids if you subscribe to traditional family values. Plus, the Pilgrims’ kids were starting to speak the King’s English with a Dutch accent, took an unhealthy liking to herring rather than cod, and looked forward to offietijd rather than tea. It was time to go. 2. The Mayflower wasn’t the First Boat. Pilgrims aren’t known for their business sense. When they first scrapped together enough cash to buy a boat, they plopped it down on a clunker called Speedwell. The old boat got them from Holland to England, where they purchased another used ship – the Mayflower – in preparation for their voyage to America. The old Speedwell leaked so bad (some historians say the crew sabotaged her) that she had to return to port. Some of her passengers embarked on the Mayflower (which made it a little more than cramped), and off they went. Most of the Speedwell’s passengers chose to remain behind in England. I can’t help but think of how the course of history was altered by this simple event. Given the influence of some of the Mayflower descendants – John Adams, Noah Webster, Ralph Waldo Emerson, US Grant, FDR, George Bush, and Alec Baldwin -I often wonder what great Americans were never-to-be simply because they literally “missed the boat.” What presidents did we miss out on? What great writers or inventors never were born to us? And why, in the great cosmic scheme of things, did we get Alec Baldwin? 3. The Pilgrims Were Not the First English in America. Schoolkids are often taught that when the first Pilgrim toe touched that hard, sandy rock at Plymouth, the Pilgrims brought the Old World to the New. The reality is that a successful English colony existed at Jamestown since 1607. 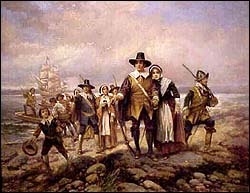 The Pilgrims didn’t arrive until over a decade later in 1620. In fact, the Pilgrims were well-aware of Jamestown and intended to flee there if their colonization efforts elsewhere in the vast North American wilderness (which they tended to refer to as Virginia) failed. There were earlier but unsuccessful attempts by the English to colonize the New World at Roanoke (North Carolina) in the late 1580’s. In one of the great mysteries of history, the Roanoke colony literally disappeared off the map. Some think they went to live with the local Indians. Others believe they were killed by those same Indians. No one has ever ruled out alien abduction, and we should probably seek a government grant to explore that theory. 4. The First Thanksgiving took a Year- There is a popular misconception that the first Thanksgiving was celebrated on arrival in the New World to show appreciation for surviving the perilous voyage in the tiny Mayflower (it almost sunk in a storm). This myth is helped in part by the fact that the Pilgrims did arrive in late November, and hey, we all know that’s when Thanksgiving is. The reality is that the Pilgrims got right to work building their tiny homes, foraging for food, and generally trying to survive that terrible first winter in the virgin wilderness. Half would be dead by the time the first buds of spring snaked from under the snow. It wasn’t until the following fall that the Pilgrims held what we think of as the first Thanksgiving. They gave thanks not only for surviving that first year’s winter, but also for the aid of their kindly Indian neighbors, who basically saved their Pilgrim backsides by teaching them what and how to plant in the native soil. When the harvest came in, it was indeed so bountiful that the Pilgrims shared it with their new friends, who brought deer, and yes, a few turkeys as well. Great post, Chris. I cannot wait to show this to others! No costs. You just submit your email and every time there is a post, it will be mailed to your email address. No spam.